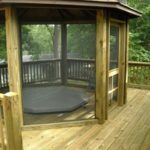 Wooden decks, pergolas, and fences have a way of making your backyard an oasis even if you don’t add anything more than a few chairs here and there. Why? Because they offer all you expect from the backyard: a safe place to relax, shade, and privacy. 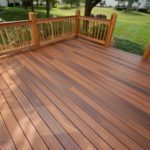 Think of it this way: a cedar outdoor decking will be lovely but how many hours you’ll spend outdoors without being protected from the elements? An umbrella provides limited protection and if it rains, forget it. You must grab your things and run!!! Install a custom deck big enough to host all your activities. So before you order, take into account your habits. Do you like to eat outdoors? Make sure the deck is large enough for the table and chairs and cover the area close to the kitchen for easy running in and out during meals – unless you prefer (and have the space) to build an outdoor kitchen too. That will be convenient! Make sure the deck comes with railing systems that add elegance to your home’s exterior but also offer protection. That’s necessary even if you don’t have kids. Don’t settle for an umbrella. Get a wooden pergola and make sure it covers the entire surface of the deck to feel completely protected whether in rainy or sunny days. 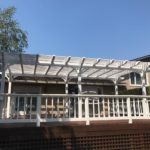 Although the traditional pergolas have boards for a roof and are not entirely covered, today you can find designs that resemble wooden gazebos. Alternatively, you can cover the top with fabric to create the desired shade. If you can afford it, fiberglass roof panels or heavy-duty plastic is also a good idea. Get a wooden fence too. It might sound irrelevant when we are talking about backyard transformations but you will realize its significance when you sit to read your book and feel the neighbor staring at you. Fences provide a strong sense of privacy because they serve as walls that separate you from the rest of the world. Isn’t that what you want when you move outdoors? In order to make your custom wood fences, decks, and pergolas work well together, you need to get the same timber and style. If you want to cut down expenses by getting more expensive decks and less expensive fences (for example), paint them all the same color to create a cohesive look. The good news is that you can easily succeed with styles. The visual effect of the exterior design is actually the sum of many things: colors, garden furniture, accessories etc. All the same, it’s best to stick to the same style when it comes to outdoor woodwork projects. If you like a modern crisp look for your fence, get a modern pergola and install cables for deck railings. It’s often suggested keeping the same style as indoors but it’s not absolutely necessary. If you were obliged to make compromises during home renovations because you have small kids or pets, do what you want in the backyard. After all, this is outdoors. And thus, time to let the designer inside of you take control. Your aesthetics, beautiful shady spots, the right furniture, and good outdoor lighting are all you need for long weekends in the oasis of your own home in the heart of the city.